The Iowa Conservation and Preservation Consortium holds a member meeting and Save Our Stuff (SOS) workshop annually. This year the University of Iowa Libraries played host because they are celebrating 30 years of collections care. 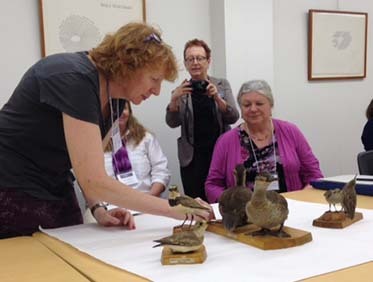 In her June 10 blog post, Mindy highlighted the wide array of workshops she attended throughout the day including taxidermy. 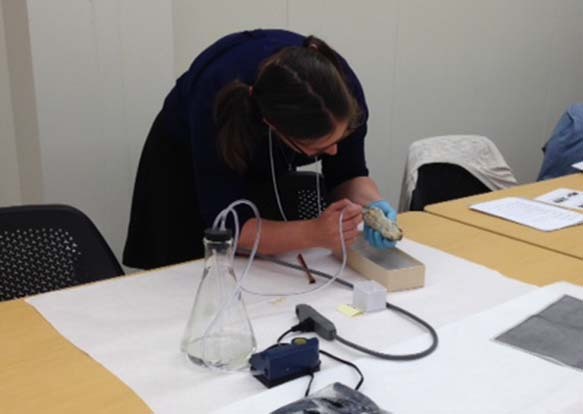 Here is a little more detail on the Taxidermy Care and Cleaning workshop taught by Cindy Opitz, Collections Manager at University of Iowa’s Museum of Natural History. 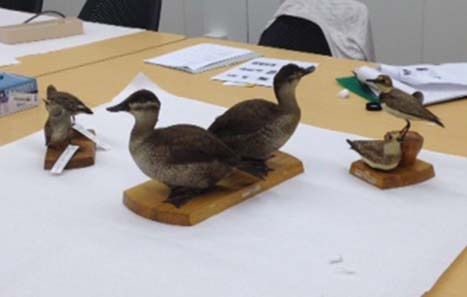 I have to admit that this is the workshop that intrigued me the most since I know nothing about caring for taxidermy specimens. Turns out that the biggest takeaway I got from this workshop is that basic care and cleaning of these objects is not unlike textile care and cleaning. Agents of deterioration and pest management are the same as what we have come to expect for all organic and protein-based materials. Cindy did remind us that one concern is the presence of arsenic and pesticides and that we should wear personal protective equipment like gloves and masks. 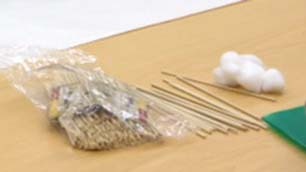 Supplies for making cotton swabs: skewers and cotton balls. To start, Cindy had us roll our own cotton swabs to do gentle “enzymatic” (saliva) cleaning of the eyes, beaks, and claws, just gently rolling, not rubbing, the cotton swab over the hard surfaces. Gentle swabbing of hard surfaces. We next moved onto vacuuming the fur and feathers on the bodies using a Nilfisk canister vacuum with adjustable speeds and micro tool attachments. For fine dust and more fragile specimens, Cindy recommended vacuuming through a nylon screen. Again, not unlike cleaning textiles. 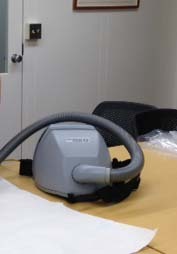 A Nilfisk backpack vacuum was also available for us to test out, but the drawbacks of the backpack were significant; it did not have adjustable speeds and it was extremely loud. Cindy also showed us a more gentle, inexpensive vacuum that we could make ourselves using an aquarium pump, Erlenmeyer flask, rubber stopper, tubing and connectors. To me, the best part about this workshop was just having the chance to hear about something other than book and paper even though the care and cleaning was not as foreign as I thought it would be. We already have the basic knowledge and skills from the care of other cultural artifacts, but of course, I would still call a conservator if I needed to do anything more difficult.